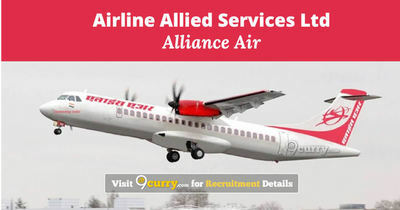 Airline Allied Services Ltd Recruitment 2019 - Below are various recruitment notifications published by Airline Allied Services Ltd (Alliance Air). As of now, we don't have any active recruitment notification by Airline Allied Services Ltd featured here. We may update as soon as the organization announces a new job notification. If you are looking for any information related to previously organized recruitment drives by Airline Allied Services Ltd, you can browse through previous job notifications mentioned below and get the new updates or information you are looking for. Airline Allied Services Ltd Recruitment 2019 - Job notification for 40 Officer, AGM & Other Posts in Airline Allied Services Ltd, Across India. Applications are invited by Airline Allied Services Ltd (Alliance Air) on or before 19 Apr 2019 for 40 vacancies. Airline Allied Services Ltd Recruitment 2019 - Job notification for 27 Supervisor (Security) Posts in Airline Allied Services Ltd, Chhattisgarh, Gulbarga, Mysore, Karnataka, Keshod, Gujarat, Jharsuguda, Rourkela, Odhisha, Kota, Rajasthan, Kalaikunda, West Bengal, jagdalpur on Contract Basis. Applications are invited by Airline Allied Services Ltd (Alliance Air) on or before 19 Apr 2019 for 27 vacancies. Airline Allied Services Ltd Recruitment 2019 - Apply Online for 42 Cabin Crew Posts in Airline Allied Services Ltd, Across India on Fixed Term Basis. Online Applications are invited by Airline Allied Services Ltd (Alliance Air) from 27 Mar 2019 to 19 Apr 2019 for 42 vacancies. Airline Allied Services Ltd Recruitment 2018 - Job notification for 45 Trainee Pilot, Station Manager & Other Posts in Airline Allied Services Ltd, New Delhi on Fixed Term Basis. Applications are invited by Airline Allied Services Ltd (Alliance Air) on or before 21 Dec 2018 for 45 vacancies. Airline Allied Services Ltd Recruitment 2018 - Job notification for 10 Co-Pilot Posts in Airline Allied Services Ltd, Delhi, West Bengal, Karnataka, Telangana, Maharashtra, Tamil Nadu, Andhra Pradesh, Rajasthan on Contract Basis. Applications are invited by Airline Allied Services Ltd (Alliance Air) on or before 30 Nov 2018 for 10 vacancies. Airline Allied Services Ltd Recruitment 2018 - Walk in for 17 Crew Controller & Asst Crew Controller Posts in Airline Allied Services Ltd, New Delhi. Candidates are invited by Airline Allied Services Ltd (Alliance Air) to attend walk-in-interview to be held on 11, 12, 18 & 19 Dec 2018 for 17 vacancies. Airline Allied Services Ltd Recruitment 2018 - Job notification for 39 Assistant Engineer, Officer & Other Posts in Airline Allied Services Ltd. Applications are invited by Airline Allied Services Ltd (Alliance Air) on or before 29 Jun 2018 and Walk-in Interview for Crew Controller to be held on 27 & 28 Jun 2018 for 39 vacancies. Airline Allied Services Ltd Recruitment 2018 - Walk in for Crew Controller Posts in Delhi. Candidates are invited by Airline Allied Services Ltd (Alliance Air) to attend walk-in-interview to be held on 27th & 28 Jun 2018 for 5 vacancies. Airline Allied Services Ltd Recruitment 2018 - Job notification for 18 Trainee Cabin Crew Post in Southern Region AASL in Airline Allied Services Ltd, New Delhi. Applications are invited by Airline Allied Services Ltd (Alliance Air) on or before 06 Apr 2018 for 16 vacancies. Airline Allied Services Ltd Recruitment 2018 - Job notification for 35 Station Manager, Trainee Cabin Crew & Other Posts in Personnel Department, Airline Allied Services Ltd, New Delhi. Applications are invited by Airline Allied Services Ltd (Alliance Air) on or before 23 Mar 2018 for 35 vacancies.